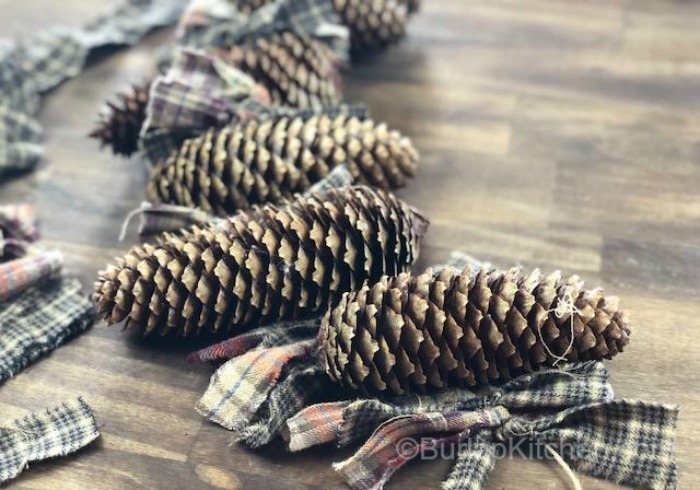 Most of the supplies needed for this Flannel & Pinecone Garland can be found right at your fingertips! We went to the local park to gather all the pinecones along with a few other supplies for another craft. Since my husband didn’t have any old flannels that I liked I headed to the Goodwill and picked some up. I bought the sunflowers at the dollar tree and while I was there I found that they also sell raffia and twine. I would use the raffia, but I would advise against the twine, as I don’t think it will be long enough or strong enough. You can head to your local Walmart to pick up a nice strong twine. I believe mine said 2 ply on the pack. Step 1: The first thing you want to do, which I did not photograph, is to bake the bugs out of the pine cones. 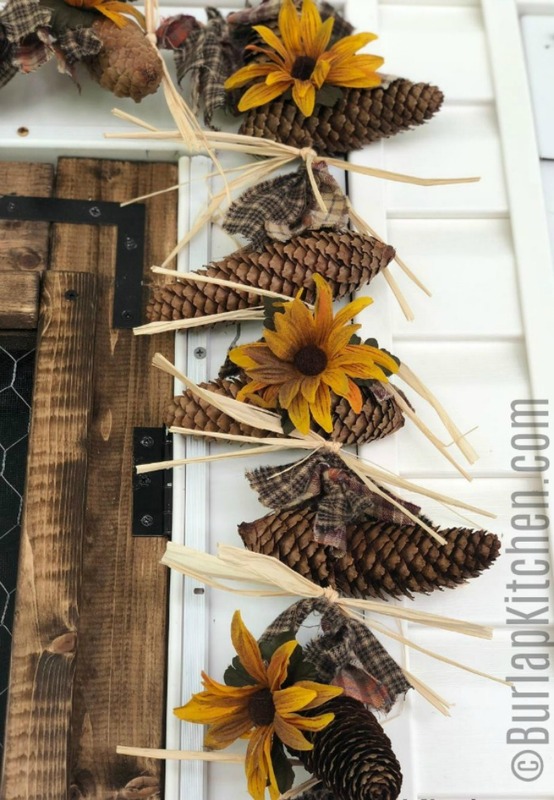 Put the pine cones on an old cookie sheet, or a cookie sheet lined with foil. Preheat oven to 200 degrees and bake pine cones for 20 minutes. 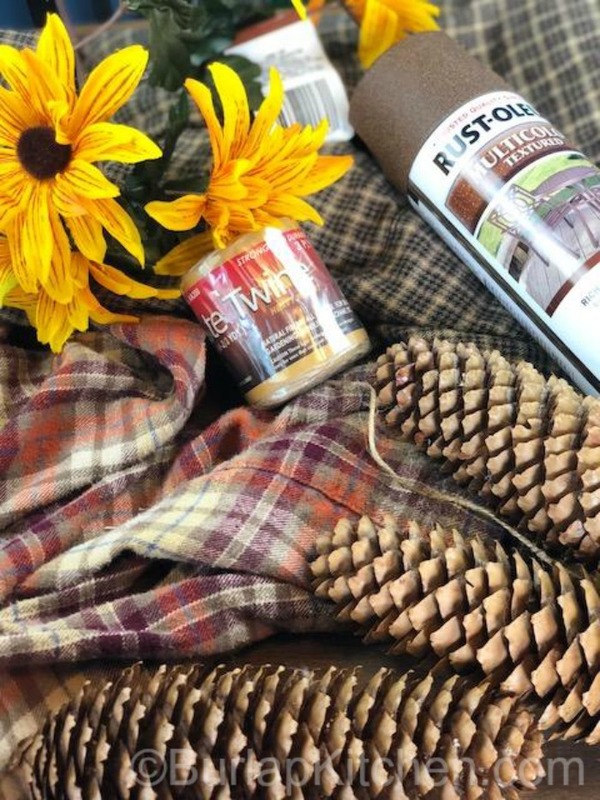 You will LOVE the way they make the house smell… like fall! Step 2: Cut the flannel shirts into strips. 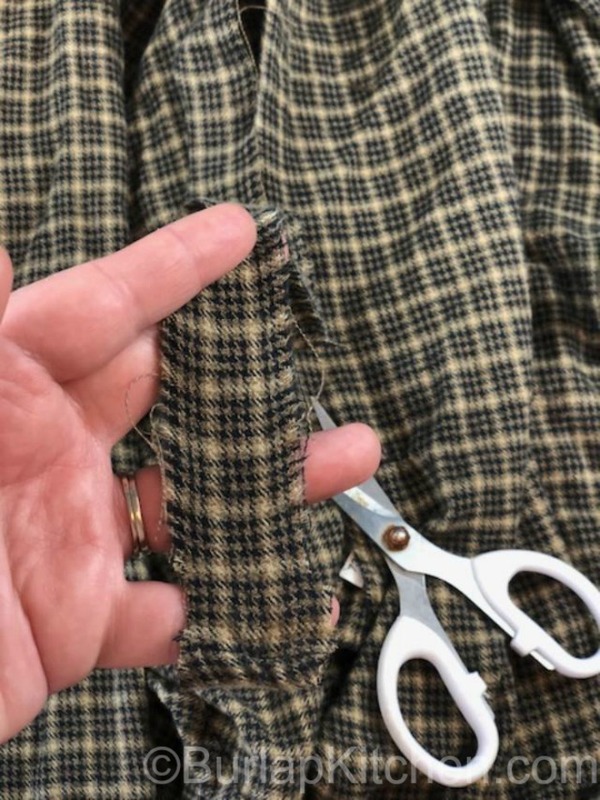 The quickest way to do this is to make a small cut at the bottom then use your hands to tear the cut all the way to the top of the shirt. Keep doing this till you have a nice stack of flannel strips. Step 3: To begin making the garland wrap twine around the pine cone a few times and secure with a knot and some hot glue. Next, begin adding flannel strips and wrapping pine cones. I like to do 4 flannels, rotating colors, and then a pine cone. Secure pine cones with glue, this will keep them from unraveling and falling on the ground when you hang it. *I’m not really sure where my head was when I was photographing this post… it seems I’ve missed capturing some of the most important steps! If you are having trouble understanding these steps please refer to my youtube channel for a full video of this DIY. Step 4: Once your garland reaches the desired length, cut the twine and secure with another knot and more glue. 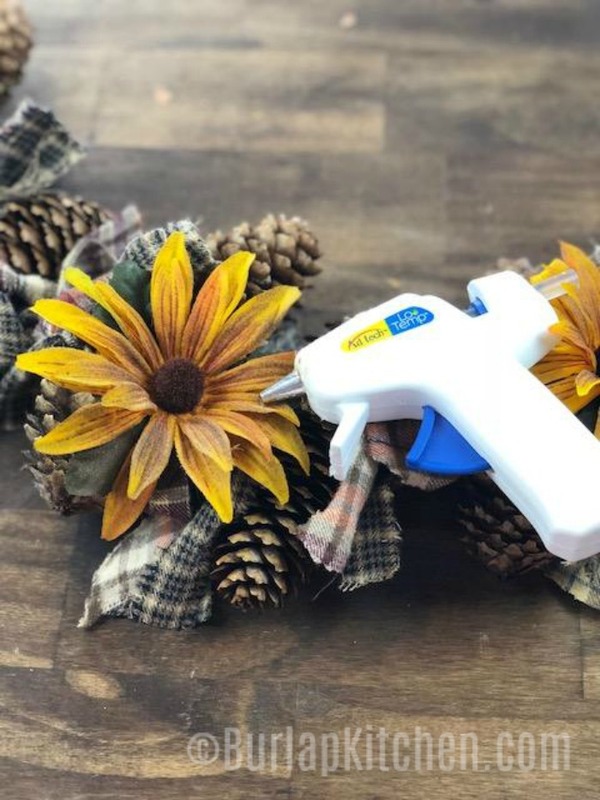 I then spray painted the dollar tree sunflowers with a light layer of multi-color texture spray I purchased at Walmart. 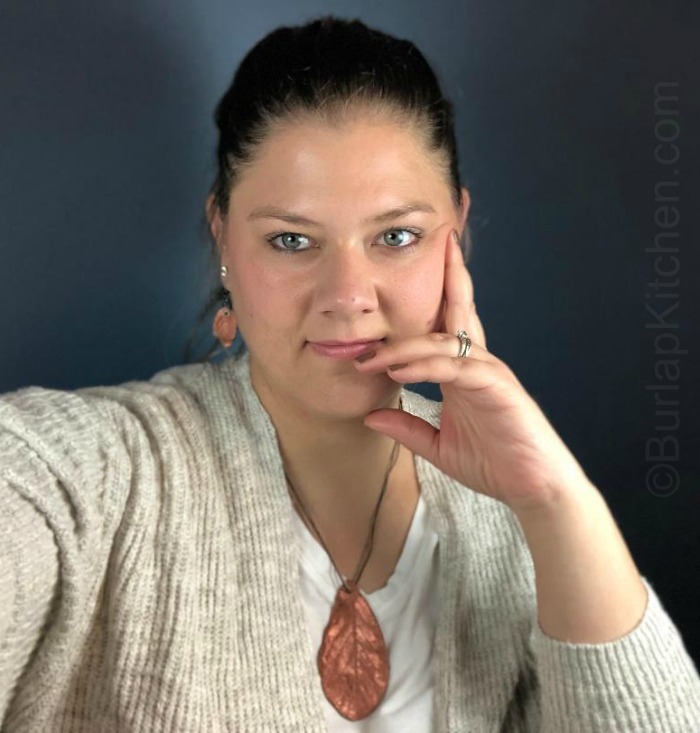 You want to use a dark brown multi color to achieve a more rustic/primitive look. A good friend taught me how to do this and I have been using this technique ever since! *I later added some raffia to this garland. You can make this with or without the raffia, it’s really up to you!